There are lots of facts to know about Arlington, TX—and here’s one of the most important: This is a Baseball Town, folks, which means we know how to have a blast when it comes to cheering on our Texas Rangers! ONE: Get a parking and transportation game plan. Self-parking: General parking is available on game days for $20. Those spots are indicated in red on the Globe Life Park parking map, which you can download here. Bonus tip: Save time and trouble when you reserve and pre-purchase a close-in spot via the Stadium Parking service. Globe Life Park also offers handicap accessible parking spaces, as well as a courtesy shuttle for the lots north of the ballpark. Find out more about both services here. To select the best lot, the Rangers website suggests that you consider whether you want to park close to the ballpark or close to the major roads leading in and out of the ballpark—and also, to keep up with the ballpark’s construction-related road closures. You can get more Rangers parking tips here. Valet parking: For $45, you can use the Rangers’ Lexus Valet Parking service, which is available for every home game on the north, east, west, and south sides of Globe Life Park. To purchase your valet space in advance, call 972-RANGERS x1. Be aware: Valet spots can fill up quickly, so we suggest that you arrive a little early and also keep your eye on the valet’s real-time game day updates on Twitter. Transportation: If you’re a guest at a participating Arlington hotel, you can ditch parking altogether and also ride to and from the ballpark for free (and look super adorable while you’re doing it!) when you take the famous bright red Arlington Entertainment District Trolley. Ask your hotel’s front desk staff for more information (or visit the trolley’s website). If you’re not staying at a hotel, you might consider using Uber, the Rangers’ official ride share service. Pick-up and drop-off is available at Camry Lot D.
For those who want to pre-game or post-game at a local watering hole, consider Humperdinks Brewpub, which offers an enormous food and beverage menu as well as an affordable ballpark shuttle service. Budget-conscious fans taking in afternoon games should check out Via Rideshare, a $3 per-trip/per-person transportation service sponsored by the City of Arlington. Via is available from 6 a.m. to 9 p.m. Monday through Friday and from 9 a.m. to 9 p.m. on Saturdays. By the way, parking opens up three hours before the first pitch—except for Opening Day, when parking opens up five hours in advance. TWO: Maximize your Rangers fan experience with media and merch. Rangers podcasts: Click here to subscribe to Spitballin’ (a weekly chat offering Rangers news and analysis) or MLB.com Extras, an inside look ahead at Rangers story lines and developing news. Free Rangers newsletters: Inbox delivery of the latest video highlights, up-to-date news, ticket specials, and more. Apps: Download MLB At Bat and MLB Ballpark for everything from live video streams to digital ticketing. Gear: Visit the Rangers online store or the Grand Slam Gift Shop for jerseys, caps, totes, and other Rangers merchandise. Season ticket handbook: This online guide for Ranger season ticket holders is chock full of helpful email addresses and phone numbers, season ticket policies and procedures, tips, suite rental info, and more. THREE: Don’t worry about eating before a Rangers game. The very first ballpark nachos were introduced to the world at a Texas Rangers game, so it’s not surprising that Rangers fans have more than 100 concession stands available on each of the ballpark’s three concourses, not to mention picnic areas for large groups and club seating with deluxe food and beverage options. If you have special dietary needs or you’re looking to save a few bucks, you can bring your own grub to the ballpark (but leave the adult bevvies at home—outside drinks are restricted). Check out the Globe Life Park container policy to find out more. FOUR: Make your dollar go farther with Rangers ticket specials and promotions. Are you a Ranger fan on a budget? Be sure and take advantage of Coca-Cola Family Packs or Dr. Pepper specials, as well as special game day promotions offering everything from dollar hot dog nights to merchandise giveaways. FIVE: If you love VIP perks, you definitely need to try a Rangers fan experience or a luxury seating option at least once. Fan experiences: Is there a tiny Rangers fan that has you wrapped around his or her finger? Check out these in-game Rangers experiences, which give young fans once-in-a-lifetime opportunities like taking the field with the players or delivering the ball to the pitcher’s mound. Luxury seating: If you like your baseball with a lot of A-list amenities, such as air conditioning, private restrooms, up-close parking, and first-class food and beverage options, you absolutely need to try out a Rangers luxury suite or the Hyundai Club—especially if you’re celebrating a special occasion or entertaining family/friends/clients. SIX: Take your Rangers fan game to the next level with a tour or a tailgate party. Ballpark tours: Baseball season is an especially exciting time to go behind the scenes at Globe Life Field and investigate points of interest like the batting cages, dugout, and press box. Game day tours are held Monday-Saturday from 9 a.m. to 2 p.m. and on Sundays from 11 a.m. to 2 p.m., and non-game day tours extend the closing time by two hours each day. Subject to availability. Tailgating: Get the party started early with a Texas Rangers tailgate, available when the parking lots open until the top of the second inning, and up to two hours from the final out. Bonus tip: You can reserve a private Rangers tailgate space, which includes restrooms, gear and other perks, right here. SEVEN: Mark your calendars for theme nights, fireworks and post-game concerts. The Rangers offer a theme night for just about everyone, from pet lovers to first responders to University of Texas fans, and all of these games are great opportunities to enhance your Rangers experience while also taking advantage of discounts and giveaways. Find out more. 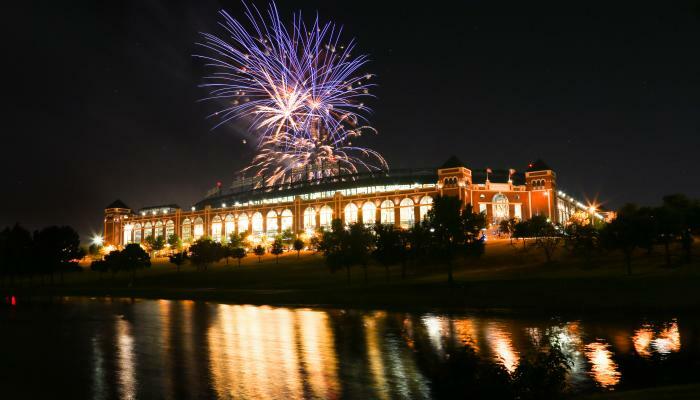 Also: If you’ve never been to a Texas Rangers fireworks show—boy, are you missing out! You can find out when fireworks are happening this season right here, and while you’re at it, be sure and check out the line up of this year’s post-game concerts, which are also a lot of fun.